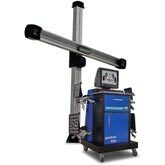 The Hofmann Geoliner 650 Imaging Alignment System is equipped with our basic software package which combines the benefits of camera technology and quality at an affordable cost. Our patented VODI Graphic Display is used with High-Definition (HD) cameras to provide visual and directional assistance to the technician during the alignment measuring procedure. The Geoliner 650 will boost your shops productivity by allowing technicians to do more alignments is less time compared to conventional systems. The Geoliner 650 Alignment System uses high-definition cameras encased in heavy-duty magnesium pods that mount to the rear wheels. A set of non-electronic, shatter-proof imaging targets are mounted to the front wheels to complete the system. Below you will find much more information about this product, including all of the INCLUDED features that set this product above the rest: Details on the Imaging Unit, Computer, & all other Featured Components; a full list of Specifications; a Photo Gallery with more pictures of this product; See Below For More Info! 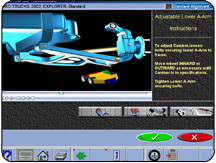 Animated Adjustment Aid: Technicians benefit from on-screen visual aids for vehicle-specific adjustments, including instructions, comments and necessary tools. Solid Construction: Heavy-duty imaging targets and wheel clamps reduce potential damage.